My Bucket List Journal is an expression of YOU! Having a bucket list reminds you of what’s really important so you can act on them. You will find inspiring quotes, thoughtful prompts and more than 30 bucket lists to inspire you to reflect, record and realize all of the dreams, goals and desires you want to accomplish in your life. 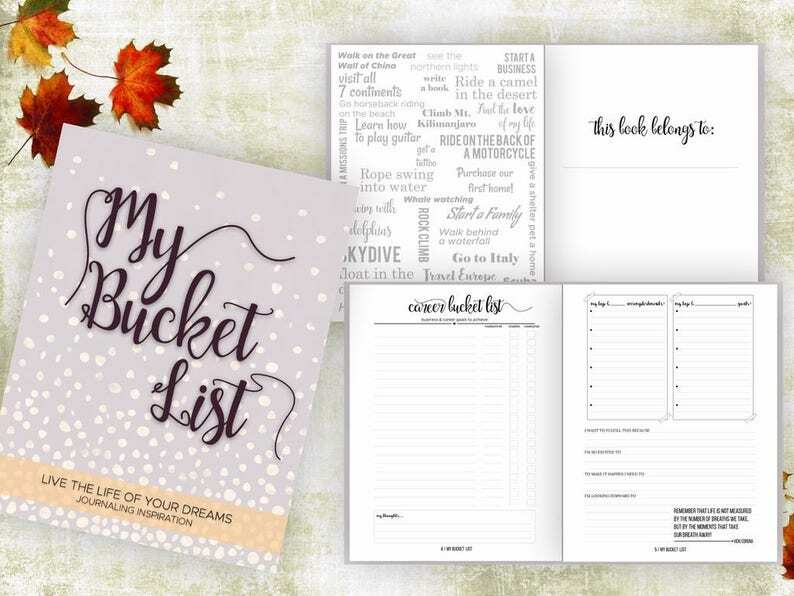 This one-of-a-kind guided bucket list journal is a tool that provides an easy and fun way to organize and keep track of all the things you've dreamed of doing. Every page is lined for insightful exercises, special notes, memories you'll never want to forget, and personal reflections once you’ve completed each one. This makes a great keepsake to record momentous lifetime events and is the perfect gift for family, friends, graduates, retirees, teenagers, co-workers...just about everyone! This listing is for the Mauve color cover. See my other listings for other color options. Bucket List Journal. Planner. Writing Prompts. Guided Journal. Bucket List Gift. Bucket List Notebook. Goals. Adventure gifts. Wine Journal. Beautiful hard covered bucket list journal. Such a unique and creative gift that I just ordered another! Personalized Bucket List Journal with Writing Prompts Book Gift, Custom Name, Custom Cover, Birthday Retirement Graduation Gift. 8" x 10".